On 2nd March 1788 the two ships of the La Pérouse expedition, the most prestigous French voyage of exploration ever launched, left Botany Bay and were never heard from again. It was not until 1828 that it was discovered that they had been wrecked off the remote island of Vanikoro in the Solomon Islands. What had happen? Were there survivors, and what was their ultimate fate? The "Mystère La Pérouse" has long been the subject of debate. But it is only in the last thirty years, that underwater archaeology has at last begun to give us answers. Much of the credit is down to one man. For Alain Conan, a native of Nantes settled in New Caledonia, the fate of La Pérouse and his crew was a lifelong obsession. 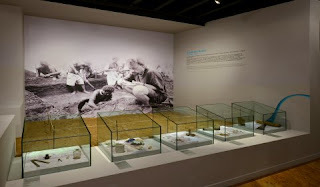 Thanks largely to his energy, the Association Salomon was formed in 1981 and sponsorship secured for no less than eight seasons of archaeological investigation in Vanikoro, between 1981 and 2008. Sadly last year, on 6th March 2017, M. Conan, was killed in a diving accident. 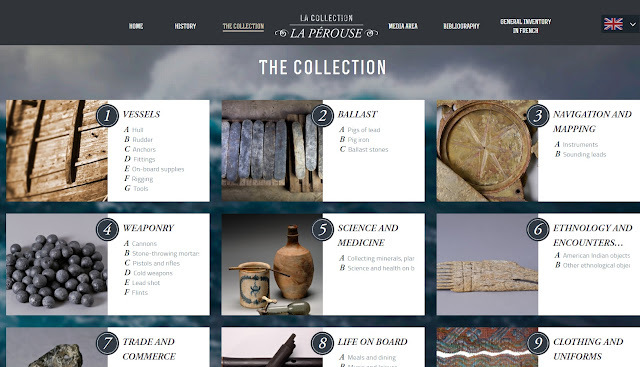 He lived just long enough to see the launch in February 2017 of the internet site "La collection La Pérouse", which showcases the finds from Vanikoro and, for the first time, makes available a comprehensive inventory. The site is particularly welcome as the major exhibits are, for most of us, impossibly far away, in the Maritime Museum in Nouméa. 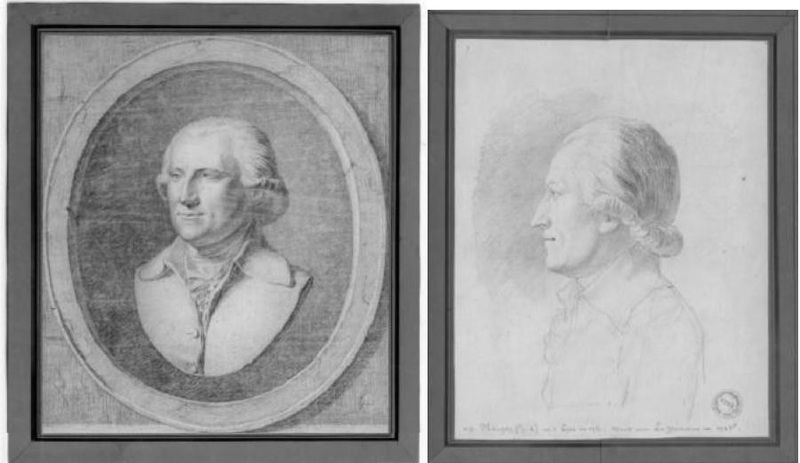 In 1791 the National Assembly sent a second expedition under Antoine Bruni d'Entrecasteaux in search of tidings. In May 1793 his two ships, the Recherche and the Espérance under the command passed tantilising close to Vanikoro but did not stop. It was said that Captain Edwards of HMS Pandora had seen but ignored smoke signals from the island, when hunting for the mutineers of The Bounty. The first definite information had to wait another thirty years. In 1826 the Irish sea captain Peter Dillon saw European objects at Tikopia in the Solomon Islands, which locals told him came from the nearby island of Vanikora. He was eventually given command of the naval survey vessel Research and arrived in Vanikoro in 1827 to investigate. A French ship under Jules Sébastien Dumont d'Urville subsequently joined him. According to Dillon's account in his Narrative and Successful Result, he learned that both ships had been wrecked on the coral reefs during a storm, that members of the crew had built a boat from the wreckage and sailed off in it, and that some survivors had remained on the island. One of the wrecks was discovered in just four metres of water to the south-west of the island. 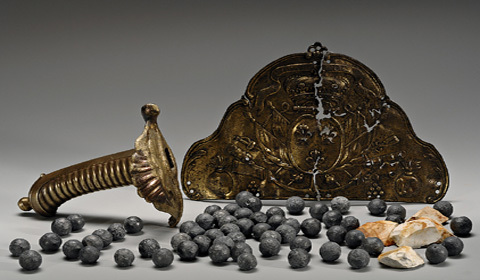 Artefacts, included a ship bell and a silver sword hilt, were recovered and taken to Paris where they were identified as belonging to the expedition vessels. In 1962 the New Zealand diver Reece Discombe located the second ship: it lay on the reef about a kilometre to the east of the first wreck, but 15 metres down. Initial excavations were carried out by 1964, using a French naval vessel, the Dunkerquoise. A ship's bell, a pulley, two bronze stone-throwing mortars, and part of quadrant, were brought to the surface. Systematic investigation under the auspices of the Association Salomon began in 1981. 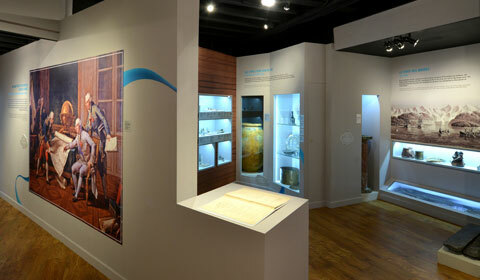 The early underwater explorations raised many signficant items from the wrecks: in 1999 the Musée de l’histoire maritime in Nouméa was inaugurated to house the finds. However, Alain Conan was convinced that the key to the puzzle lay on the island since the oral tradition of the islanders, related to Dillon, referred to a camp built by the French after the shipwreck. It was essential to find this, in order to determine the fate of the survivors. The terrestrial archaeology was taken on by the Institut de Recherche pour Développement (IRD), under the direction of Jean-Christophe Galipaud. 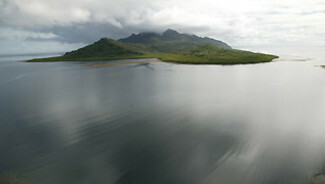 The team struggled with the "detestable" climate of the island, with its heavy rainfall and dense vegetation. Traces of the camp were finally uncovered in the area of Païou, near the delta of the Lawrence River, in 1999. 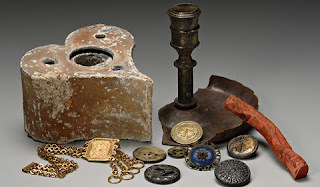 The archaeologists discovered the remains of a palissade, plus numerous small objects, (fragments of china, the bowl of a pipe, buttons, musket balls, candle holder, part of a military compass). 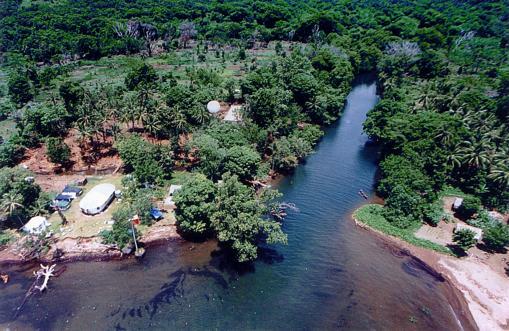 In 2003 great hopes were placed on the excavations on the island, which had been abandoned without completion. 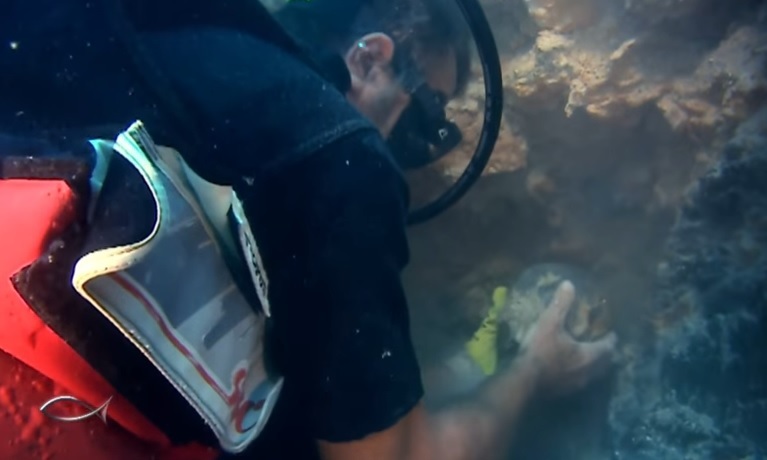 However, it was the underwater archaeologists who made the surprise discovery when they retrieved an almost perfectly preserved skeleton from the wreck on the reef. (This is unusual as the bodies of the drowned usually swell up ,decompose and are eaten by marine animals.) 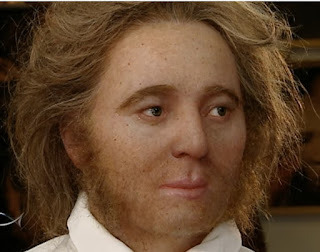 Detailed examination was carried out at the research laboratories of the Institut de Recherche criminelle de la Gendarmerie nationale in Paris, and the artist Elisabeth Daynes created this truly striking facial reconstruction. The unknown mariner was solemnly interred in Brest in 2011, with full military honours. 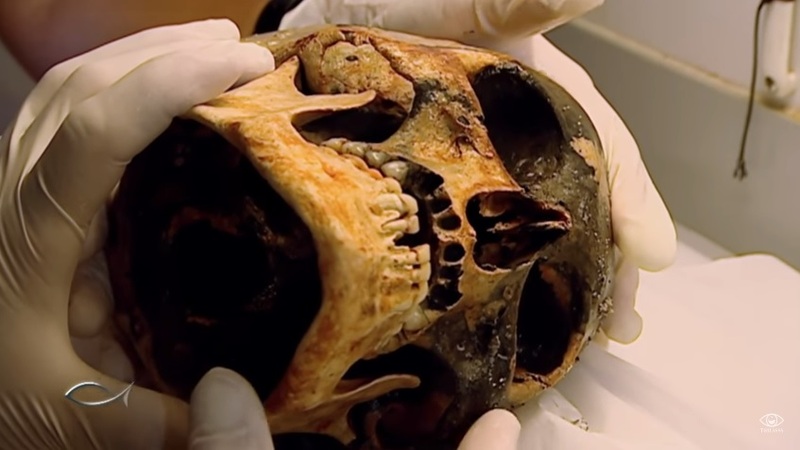 Forensic anthropologists at the Gendarmerie nationale put the age of the individual at around thirty to thirty-five; he was above average height, lightly built and had almost perfect teeth. The presumption is that he one of the savants with the expedition. Genetic analysis has so far proved inconclusive. 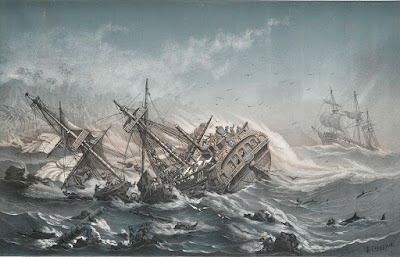 It was at first thought he was the artist Duché, who was on board the Astrolabe, but this idea was abandoned in 2005 when the wreck was identified as the Boussole. The current front runner is Jean-André Mongez, chaplain and naturalist aboard the Boussole, who was a man of thirty-six. This idea is strengthened by the fact that a number of ecclesastical objects were found in the vicinity of the skeleton, as well as pieces of porcelain featuring the coat-of-arms of his congregation of Génovéfain canons. 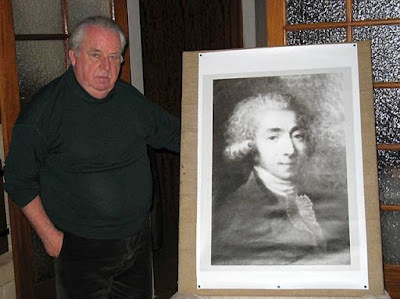 Another possible candidate is the astronomer on the Boussole, Joseph Lepaute d’Agelet. Personally I am convinced this is our man; the facial reconstruction is so strikingly like his surviving portrait. 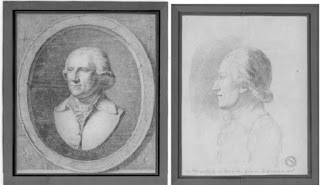 Portrait of Joseph Lepaute d’Agelet, enlarged from a miniature. Published in Ouest-France 20 janvier 2008. In 2005 the Association Salomon obtained French government funding and the use of the naval survey vessel Jacques Cartier for a much larger scale investigation. A sextant stamped "Fait par le sieur Mercier", inventoried among the instruments on the Boussole, enabled the wrecks to be identified. It would seem that it was the Boussole which ran aground on the reef. The Astrolabe tried in vain to find passage through into the shelter of the island and sank at only a few metres depth. The mariners at the camp were therefore probably the crew of the Astrolabe, which makes it unlikely the La Perouse himself was among them. 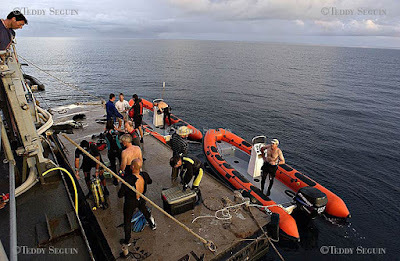 The underwater archaeologists attempted to reach the captain's cabin on the stern of the Boussole which was the part buried deepest in the coral, but in the end were forced back by weather conditions. The final expedition, in 2008 was the most ambitious of all; a team of seventy members were involved over a period of thirty days. Unusually low tides exposed new areas of the coral reef and there were further significant finds from the wrecks, including the massive lead weight from a naval plumb line. Attempts were also again made to explore the island. There were several hypotheses still available - some thought that the shipwrecked men had constructed several boats; they might perhaps they would have been able to use the longboat from the Astrolabe. There was also the possibility that they had been massacred by natives, though Dumont d'Urville in 1828 was told that the last survivors had only just died. Members of the Association Salomon were convinced that the men had embarked from the island. According to Alain Conan, there were several possible bloodlines - in the mid-19th century a family called Lavaux in the Admiralty Islands claimed to be descendants of Simon Lavo, the surgeon of the Astrolabe. However, despite determined efforts - and a whole paraphenalia of surveying equipment - Jean-Christophe Galipaud's excavations remained inconclusive; he found neither a shipyard (disappeared beneath the waters of the bay at the mouth of the river?) nor a signalpost at the heights of the crater. 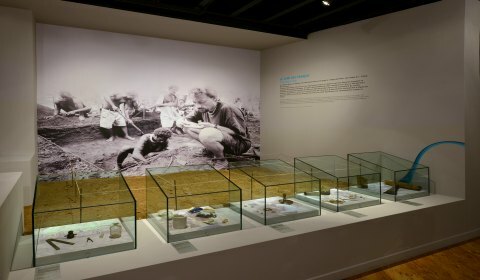 In 2017, Dr Garrick Hitchcock, an anthropologist from the Australian National University, drew attention to a piece of documentary evidence which has up-to-now been almost entirely ignored. Dr Hitchcock's find is an article from an Indian newspaper, The Madras Courier, for December 1818 which relates how two ships bound for Calcutta from Sydney, rescued a castaway Indian sailor, Shaik Jumaul, on Murray Island in the Torres Strait Islands. When interviewed, Shaik Jumaul revealed that he had seen swords and muskets on the islands, "differently made from English", as well as a compass and gold watch. The objects were said to have come from a ship wrecked off the Great Barrier Reef, within sight of the island thirty years earlier. White men were reported to have left the wreck and tried to land in boats, but had all been killed in the ensuing fighting. The only exception was a young boy who had been spared and brought up by the Islanders; Shaik Jumaul was shown his clothing. The boy had subsequently left the island one night in a canoe, together with two girls, and never been seen again. Could this be the vessel constructed by survivors from the La Perouse expedition? The timing and the geography fit. The crew list also included a ship's boy, François Mordelle, from the port of Tréguier in Brittany. The final of four films for television produced by Yves Bourgeois. 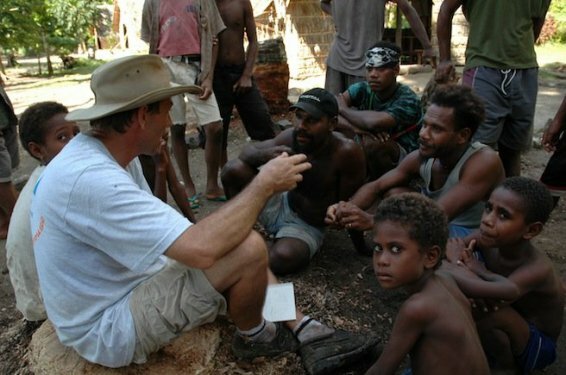 Garrick Hitchcock, "The mystery of the La Pérouse expedition survivors: wrecked in Torres Strait? "The Conversation, 30.08.17.